It’s hard to imagine doing schoolwork without ordinary supplies like paper and pencils. Yet many students in remote and economically depressed Native American communities struggle against such odds. 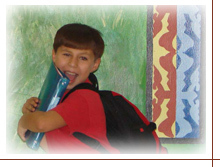 Our School Supplies service generates enthusiasm for learning at remote reservation schools. To help these youngsters get off to a good start each fall, the School Supplies service provides basic materials to schools serving the most impoverished tribes in the Northern Plains and Southwest states. This service also assists five regional American Indian boarding schools in California, Oregon, North Dakota, South Dakota, and Oklahoma. Each school year, more than 17,000 students on dozens of reservations receive supplies from us. The goods distributed through this service allow teachers to begin instruction on the very first day of school, and help students complete both in-school and homework assignments on time. Materials vary based on grade level and the items donated each year, but often include pens, pencils, markers, erasers, scissors, glue sticks, rulers, paper, index cards, notebooks, folders, and backpacks. These schools are filled with bright students who have plenty of spirit and desire to learn. What they need are the basic tools to excel in school and in life. Students volunteer to unload donated supplies on the Fort Belknap Reservation in Montana. The AIEF program helps build strong, self-sufficient Native American communities by forging close working relationships with reservation volunteers. At each school, we work with a Program Partner who is a local teacher, counselor, or administrator. Partners apply for the service during the summer for the upcoming school year. We obtain the supplies through generous gift-in-kind donors and trucks them to each community. Local volunteers then distribute the materials to each student. For young adults pursuing vocational or technical training, we also offer the Tools of the Trade service. We provide grants to a few post-secondary schools so they can purchase professional supplies for Native American students. For example, those learning carpentry skills may need hand tools, while nursing students may need stethoscopes, blood pressure cuffs, and so on. The generosity of donors like you shows Native American students of all ages that there is a world of caring people beyond the isolation of their communities. Here are a few examples of how the School Supplies service touches the lives of Native American families. "My husband and I are full-time college students. Our goal is to teach in our Native school. The school supplies we received for our three girls were very much appreciated on our limited income. We as a family would like to thank all those responsible."